As I mentioned last time, the difference between Ikebana and contemporary art is similar to that between haiku and a novel. The former resonates mainly in the senses, while the latter resonates mainly in the intellect. Realising such differences is not a conclusion, but a starting point in investigating what Ikebana is. We have to face more and often more complicated questions. Ikebana values more than anything how it appears in the work’s internal contexts such as materials and their composition. Isn’t that a characteristic of design rather than art? It is generally agreed that Western floristry belongs to design rather than art. It has to be first of all a commercial product, which is a realistic necessity. Of course some of the Western floral works can be really artistic. For instance, look at some of the works included in “International Floral Art” by Stichting Kunstboek, Belgium. On viewing the many fascinating works including my own, one might realise that the boundary between design and art is rather ambiguous even in Western floristry. Then, what about Ikebana? Is it design or art? 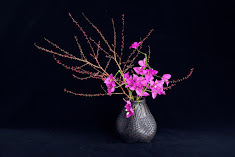 In this series, I have been criticising again and again the statement that “Ikebana is art”. It is too simplistic. In some aspects Ikebana is like design, in other aspects it is like art. To answer this question, we probably need to look at Ikebana from a different perspective. What is that perspective? I’ll keep writing about it next year. 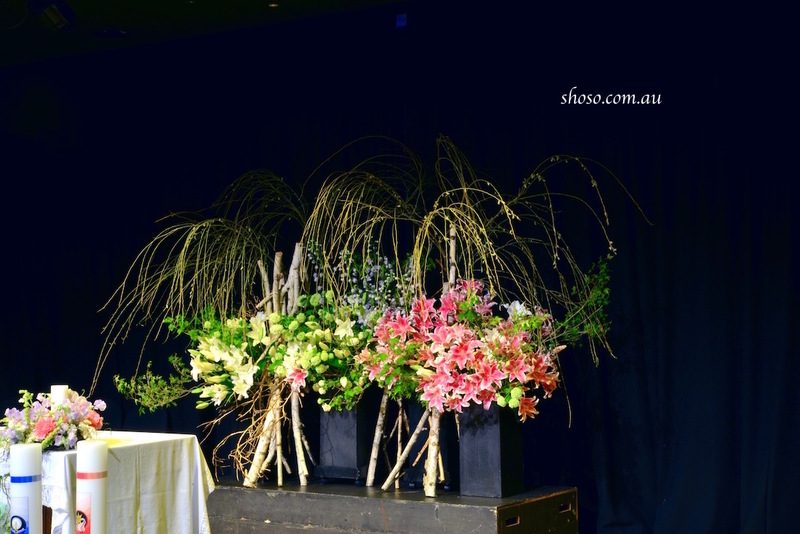 This is a work I made for a graduation ceremony of a girls’ college in Melbourne. The person in charge had seen my large work at the Lorne Sculpture 2016 and my small table arrangements for their grandparents day, and decided to commission me again for this event . As you can imagine, it was very well received. It may be rather rare to have flower arrangements of this scale at a school event in Australia. However, I hope that large flower arrangements will soon be highly recommended in any important event, not just in schools, but also in other organizations. In Japan it is a common sense to have a flower arrangement on important occasions. Maybe it should be a mission of Ikebana artists in Australia to promote such a notion about the function and power of flowers.